Spending the first two weeks of October in Italy has really thrown me. In my mind it’s only like the 15th. I kept thinking I had a couple more weeks before I needed to worry about sharing a yummy Halloween treat. Well I don’t have a couple weeks, I only have a couple days so here it is my friends. 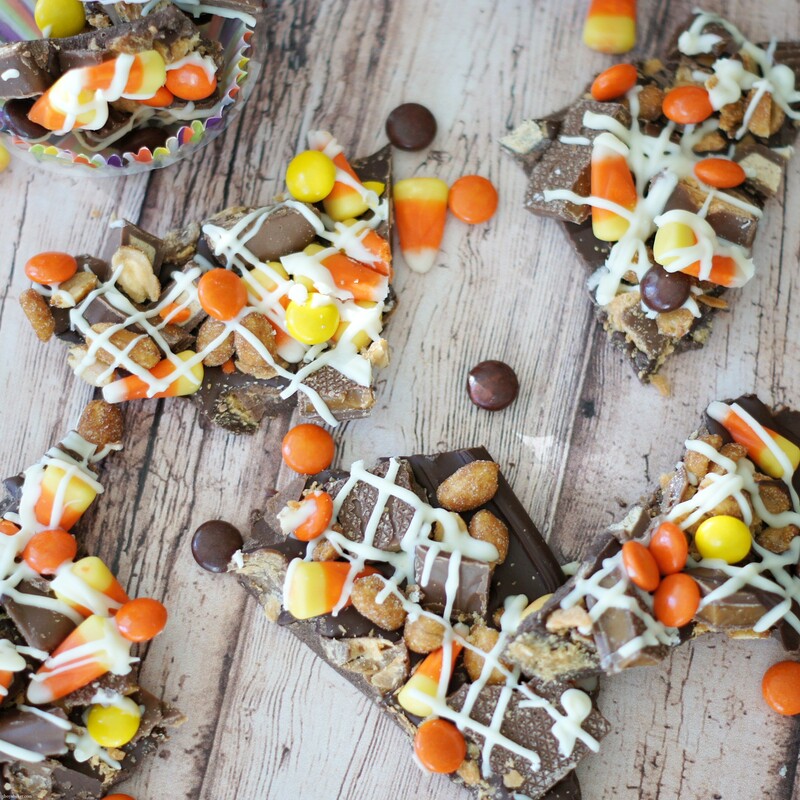 . . .insanely good Halloween peanut butter and toffee candy bark. 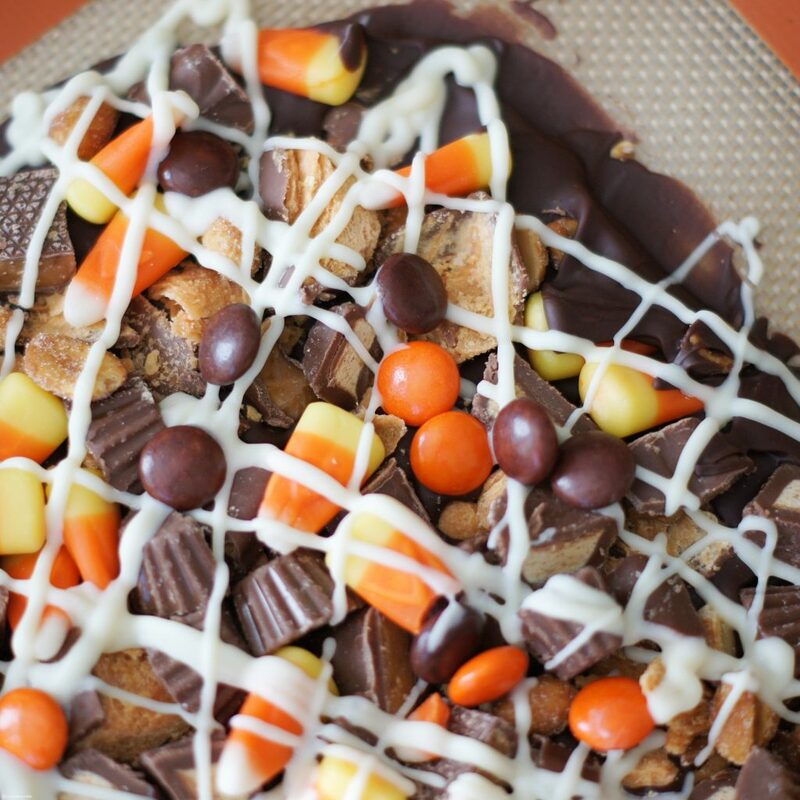 It’s chock full of some of my very favorite candy bars and then drizzled with white chocolate and topped with Reese’s pieces, another one of my favorites. This is so simple to make and looks so pretty I think. I should warn you though, it’s highly addictive, at least it was for me anyway. This bark is full candy bars, honey roasted peanuts and drizzled with white chocolate. . .super sweet but incredibly delicious! Line baking sheet a silpat liner or foill. Stir chocolate chips in heavy medium saucepan over low heat until melted and warm (not hot) to touch. Pour chocolate onto foil; spread to 1/4-inch thickness (about 12x10-inch rectangle). Sprinkle with Butterfinger candy, toffee, peanut butter cups, nuts, and candy corn making sure all pieces touch melted chocolate to adhere.